Every Who down in Whoville loves Christmas, but the Grinch, who lives just North of Whoville, does not. This year, the Grinch has had enough and decides he's going to steal Christmas so everyone will be just as miserable as him. You're not a mean one, Mr. Grinch, you just have some childhood trauma to work out! 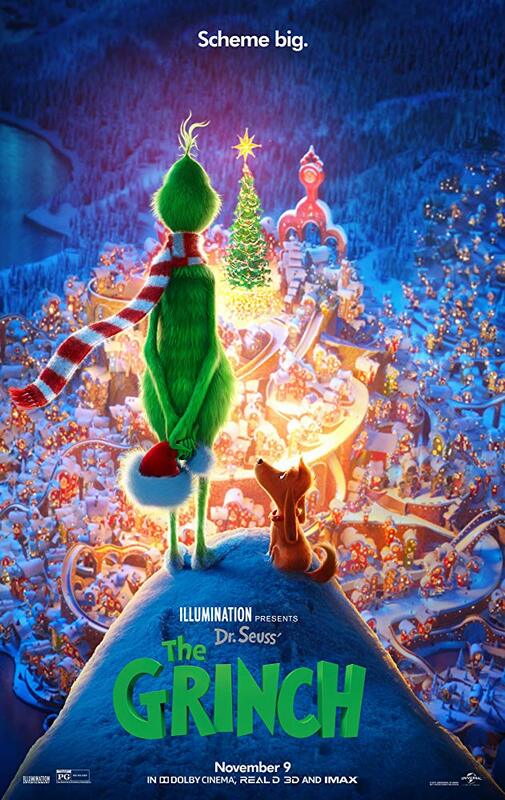 This latest version of "The Grinch" comes courtesy of Illumination Animation and is directed by Yarrow Cheney and Scott Mosier. It is written by Michael LeSieur and Tommy Swerdlow, and is, of course, based on the children's book "How the Grinch Stole Christmas" by Dr. Seuss. If the people in your life love you, you probably already know what this story is about. The Grinch (Benedict Cumberbatch) hates Christmas. All of the Whos down in Whoville love Christmas, and they show it in every way imaginable. They decorate their town with Christmas decorations and lights aplenty, they sing songs, they open presents and have a tremendous feast at the end of the day. The Grinch is tired of everyone being happy while he's miserable and alone. So, he concocts a plan to steal Christmas from the Whos. What started as a rather short children's book has been adapted into a 30 minute animated short film, a live-action feature, and now, an animated feature-length movie. Just like all the other versions, this incarnation of "The Grinch" tries to capture the spirit of Christmas and send the message that Christmas is about more than just presents, lights, and big fancy meals. It will absolutely be pleasing to the kids in the crowd, mostly because of its vibrant, bright and colorful aesthetic. The animation looks fantastic. This is probably the best looking movie Illumination has offered thus far. The story is worked around loads of goofy antics, though it is light on fart jokes, which was surprising to us. Benedict Cumberbatch was an excellent choice to voice the Grinch as he truly embodies the crotchety, bitter, steely nature of the character. The supporting cast, including Rashida Jones as Donna Who, Kenan Thompson as Mr. Bricklebaum, Angela Lansbury as Mayor McGerkle, and Cameron Seely as Cindy-Lou Who, is excellent as well. 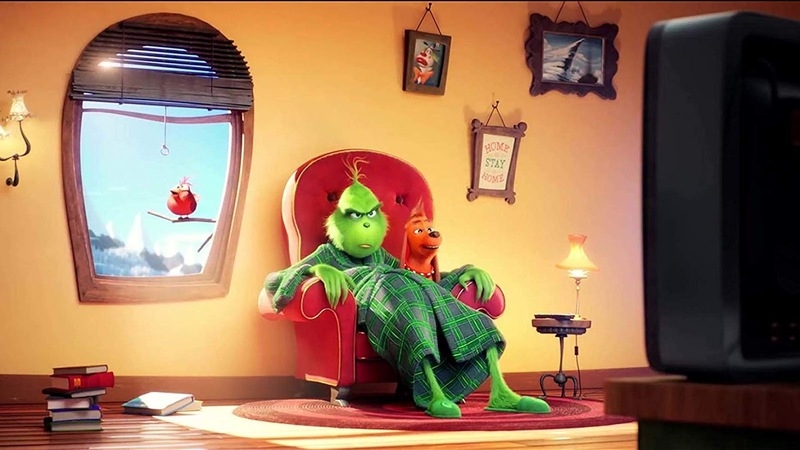 When it comes down to it, "The Grinch" is a cute movie, and there is certainly some fun to be had while watching it. That being said, the story only comprises about 30 minutes of content, maybe 45 if you stretch it. With a runtime of 90 minutes, that means there are a good 45-60 minutes of pure filler and additions like zany chaos, silly slapstick, and elongated narration, none of which necessarily adds anything to the story. This will probably be ok for younger audience members, but adults may find it tiresome to watch a fat reindeer shoot whipped cream into its mouth only to see it come out its nose. If you're looking to get in the Christmas spirit and want to see a semi-fun holiday movie, there are worse choices in theaters right now than "The Grinch." The story may miss the point sometimes, but its vibrancy and cutesy nature help keep this movie just Christmasy enough to be tolerable.